Show your cage yet again. Here we go again...more cage pictures. Here is one of my previous cage. The new one is just a little different. No 1x2 loft on the end. Instead the loft just runs on grid wide all along the back. If anyone is looking for grids, Staples has a few (not a lot) at each store, marked down for clearance. $13 for 6 cubes. Only black though. But the spacing is the safe one. Ooo! I need to go to Staples Monday. It's near my workplace. Sus, what part of the store? Each store I went to had their Clearance stuff in different areas. Two had them in the center of the store, one in the back. Look under the tables too. That was what I was afraid of. I find Staples to be one of the most confusing stores I ever go in. I can't seem to find anything, ever, even when I just saw it 2 minutes ago. Doesn't really matter though, I need white grids. The stores here aren't that big. They have a big red sign that says clearance. I got three boxes. Oooh now I'm mad! The exact same brand, Organize Everyday, sells 4-cube boxes here for TWENTY DOLLARS. Grrr. Well, I'll take a look next time I'm near the shopping center with Staples. Thanks for the picture of the box. That always helps a lot for me. I finally finished my cage! I used the large Fiddle Sticks for the ramp and covered with a piece of fleece. I know I need to add to that big open space. What size PVC pipes do you use? Very nice! What kind of grids are those, BB&B? Yes, that is where I got them from. SweetWhisper that is a VERY nice cage! It looks so clean and tidy and modern. 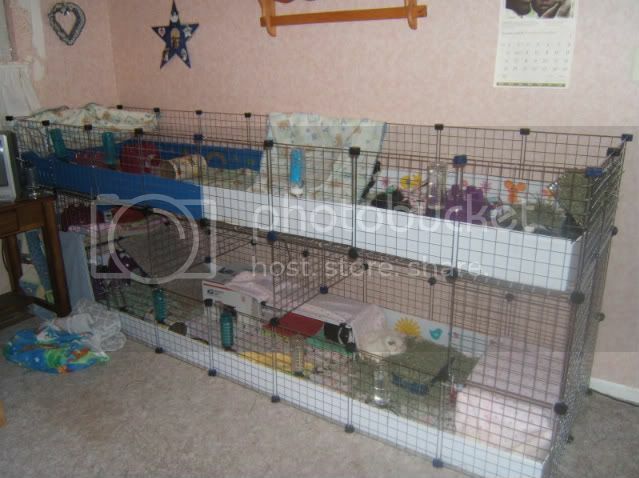 It looks like an IKEA pig cage! Piggy Vittles, I like your cage too! Lots of open space! Is it hard to clean with the cage on top? Maybe it is because I am half Swedish. SweetWhisper, you may want to consider moving the houseplant away from the cage. Some guinea pigs can be very determined to reach and chew on forbidden things. Quick question, this seemed like the best place for it. If I remember right, there's a thread or some instructions somewhere on how to cut the doorways off of pigloos to make them bigger - can someone help me find them? I looked in the care guide and did a search, but I didnt find what I was looking for. I do agree with moving that plant, just in case. I like where you covered the coroplast there. Is that a report spine? I need something new to go all the way around my cage and don't really want to buy a million report covers so I'm looking for other ideas.